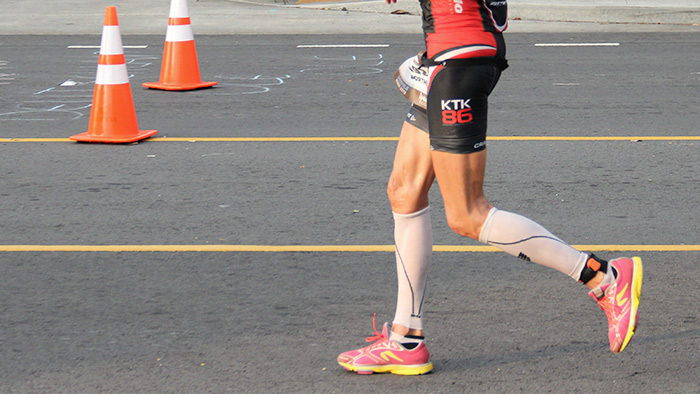 The right cadence for runners is a hotly debated topic among runners and triathletes. While there is no perfect single number, there is a range that you should aim for. Improving your cadence not only will help you run faster with the same or even less effort, it can also lessen your chance of injury. Most running injuries result from three aspects of your form: heel striking, over-striding and/or cadence. The good news for runners is that cadence is probably the most important of these three and, when improved, will also improve your chances of having zero knee issues1. Count the number of times your left foot hits the ground in 30 seconds then double it to get the total for 60, then double it again to get the total for both feet. Many watches now have the ability to measure your running cadence. Other wearable devices also measure running metrics, including cadence. Most recreational runners will have a cadence between 150 to 170spm (strides per minute) topping out at 180spm2. A cadence of less than 160spm is usually seen in runners who overstride. The good news is that as you improve your cadence, you will simultaneously be correcting your overstriding. The shorter your stride length, the quicker your stride rate, the faster and better you run. If you have a low cadence, you most likely have a long stride which makes for a choppy and more bouncy run. The more bounce and over striding in your gait, the more susceptible you are to injury3. Shortening your stride length with increase your cadence, which will make you faster and less injury prone. As a bonus, when you shorten your stride you will also change the position of where your foot lands beneath you. The optimal placement of your foot is beneath your hips (not out in front of them) which is where your foot will automatically land if you take the necessary steps to increase your cadence and shorten your stride length. This is the point of your center of gravity and where the least amount of impact will occur. Your turnover will increase which will propel you forward and will waste less energy since you will now be moving forward and back not up and down. There is not necessarily a magic cadence number for everyone but, there is an ideal cadence for you personally. Several unique factors such as height, hip mobility, and level of overall fitness will all play a role. Find your current cadence and then add 5 to 10 percent. For example, if you’re current cadence is 160spm, your goal would now be 168spm. Start by increasing your cadence for only one to two runs per week or for short periods during each run. Practicing on a treadmill is often the best way to start since you can set your correct speed and it will remain steady. Once you have comfortably run your new (and improved!) cadence for a 5K run or race, you can confidently add another five percent and repeat the process. Beware of anyone or any article touting 180spm as the “best” or “correct” cadence. This comes from the 1984 Olympics where famous coach Jack Daniels counted the strides of all of his elite distance runners and, of the 46 he studied, only one was under 180spm (176spm). Coach Daniels further noted that in his 20 years of coaching college students, not one was over 180spm. Unfortunately, he is being taken out of context and even misquoted lately, stating all runners should be at 180spm which simply is not true. Each runner has a cadence that is best for them. By recording your current cadence and using a few simple cues around your stride length and form, you can increase your cadence to be more efficient and faster.